The Met Office has issued a weather warning as high winds and heavy rain are expected across the region, this weekend. The national weather service provider has issued a yellow warning for today (December 21) and has forecast winds of up to 70mph - over hill tops. Winds are expected to be particularly gusty from Sunday, continuing into much of Monday and are likely to lead cause disruption to travel. 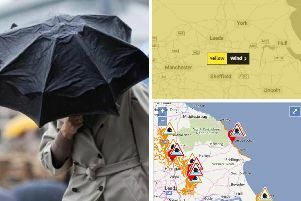 The Met Office has warned high river levels across Yorkshire could cause minor flooding, affecting some road networks and adding to travel disruption on the roads.